Currently viewing the tag: "Kander & Ebb"
The Tony Award-winning Vineyard Theatre (108 East 15 Street) will present the world-premiere of the new musical THE SCOTTSBORO BOYS -- with music and lyrics by Tony Award-winners John Kander and Fred Ebb, book by David Thompson and directed by Tony Award-winner Susan Stroman with musical direction by David Loud -- beginning previews February 12, 2010 prior to an official opening date of March 10, it has been announced by Vineyard Artistic Director Douglas Aibel. THE SCOTTSBORO BOYS explores the infamous "Scottsboro" case of the 1930's when a group of African American teenagers were unjustly accused of attacking two white women -- and the boys' attempts to prove their innocence. The musical THE SCOTTSBORO BOYS is a stirring and provocative new work depicting one of the most memorable and notorious chapters in the history of race in America. Following a series of readings and workshops at the Vineyard in 2008 and 2009, THE SCOTTSBORO BOYS -- previously announced for a developmental Lab Production during The Vineyard Theatre's 2009-10 season -- will instead be given this fully-staged production. Casting &additional members of the creative team for THE SCOTTSBORO BOYS is to be announced. THE SCOTTSBORO BOYS reunites The Vineyard Theater with John Kander, David Thompson and Susan Stroman -- who along with the late Fred Ebb -- previously collaborated on The Vineyard's revival of FLORA, THE RED MENACE in 1987. 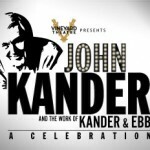 The legendary collaboration of John Kander and Fred Ebb over four decades resulted in some of the most beloved and enduring musicals in theater history: from FLORA, THE RED MENACE to CABARET (two Tony Awards - Best Musical and Best Composer and Lyricist); ZORBA, CHICAGO, and WOMAN OF THE YEAR (Tony Award, Best Original Score); to KISS OF THE SPIDER WOMAN (Tony Award, Best Original Score), CURTAINS, THE VISIT and SKIN OF OUR TEETH. They also collaborated for film and television on such memorable works as LIZA WITH A Z (Emmy Award); HBO's LIZA MINNELLI'S STEPPING OUT (Emmy Award); the films FUNNY LADY (Oscar nominated for "How Lucky Can You Get"); LUCKY LADY, NEW YORK, NEW YORK, STEPPING OUT and CHICAGO (Oscar nominated for Best Song). David Thompson is a Tony Award nominee for Best Book of a Musical for STEEL PIER. His other credits include the script adaptation for CHICAGO, and the musical THE WORLD GOES 'ROUND, a musical revue of the songs of Kander and Ebb (New York Drama Desk and Outer Critics Awards). In addition, he has written new librettos for the revival of FLORA, THE RED MENACE, and Jerry Herman's DEAR WORLD. Mr. Thompson is an Emmy nominee for SONDHEIM: A CELEBRATION AT CARNEGIE HALL. Susan Stroman won two Tony Awards as director and choreographer of THE PRODUCERS. She co-created, directed and choreographed the groundbreaking musical CONTACT for Lincoln Center Theater, winning the 2000 Tony Award for Best Choreography, along with the Drama Desk, Outer Critics Circle and Lucille Lortel Awards and a 2003 Emmy Award for LIVE AT LINCOLN CENTER. Other Broadway credits include YOUNG FRANKENSTEIN, OKLAHOMA! (Drama Desk, Outer Critics Circle, Olivier Awards), THE MUSIC MAN, STEEL PIER, SHOW BOAT (Tony, Outer Critics Circle Awards) and CRAZY FOR YOU (Tony, Drama Desk, Outer Critics Circle, Olivier Awards). Off-Broadway productions include AND THE WORLD GOES 'ROUND and FLORA, THE RED MENACE at The Vineyard Theatre. Ms. Stroman is the recipient of the George Abbott Award for Outstanding Achievement in the Theatre and the winner of a record four Astaire Awards. The Vineyard Theatre is the recipient of the Tony Award for the musical AVENUE Q and continues as producer of the musical's current production at New World Stages in New York. As well, The Vineyard has produced the musical [title of show] on Broadway. One of the nation's leading non-profit theatre companies dedicated to new plays and musicals and bold programming, The Vineyard has produced the Pulitzer Prize-winning productions of Edward Albee's THREE TALL WOMEN, and Paula Vogel's HOW I LEARNED TO DRIVE. The Vineyard has consistently premiered provocative, groundbreaking works and developed innovative educational collaborations. Recent productions include last season's acclaimed WIG OUT! by Tarell Alvin McCraney and The Civilians' THIS BEAUTIFUL CITY. The Vineyard opened its 2009-10 season with the enormously popular play A BOY AND HIS SOUL, written and performed by Colman Domingo, which the Vineyard recently announced is expected to receive a commercial Off-Broadway production later this season. This spring, the Vineyard will produce the world premiere of Adam Rapp's THE METAL CHILDREN and the new musical THE BURNT PART BOYS by Mariana Elder, Nathan Tysen and Chris Miller, directed by Joe Calarco; which will be a co-production with Playwrights Horizons. Vineyard Theatre is under the guidance of Douglas Aibel, Artistic Director, and Jennifer Garvey-Blackwell, Executive Director. Tickets for THE SCOTTSBORO BOYS are $70 and will go on sale to the general public January 4, 2010. Vineyard Theatre members are guaranteed seats with member priority booking beginning early December 2009. Two show memberships are now available for $98. For information about The Vineyard Theatre, call 212-353-0303 or visit www.vineyardtheatre.org.